Lightning Inverters | N1 Critical Technologies, Inc.
N1 Critical Technologies is one of the leading distributors of lighting inverters and equipment in the United States. Lighting inverters maintain crucial AC Power to operate all emergency lighting at “full light” output, providing superior dependability and security to any office, commercial or industrial environment. Our emergency lighting inverters provide the performance and dependability you need. Each meets or exceeds all requirements and building codes — such as the Life Safety Code (NFPA 101) — and are UL 924 tested and certified. Let N1 Critical sales engineers design a system for you that facilitates safe occupant exit during a building fire or other emergency situation. We’ll also design a system that is both highly efficient and space saving while providing the maximum power for the longest time. 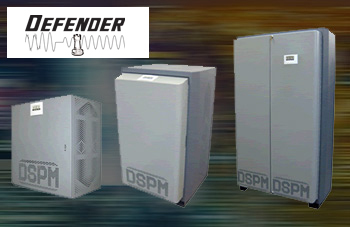 DSPM’s online emergency lighting inverters are called the Defender. They defend your environment against unwanted power outages and electrical disturbances. • DSPM Watchdog software always on guard. • Display monitor keeps you in control 24/7. • Dependable DSP/PWM technology for unsurpassed reliability. • Economical for the lowest overall cost for your light safety, with an Energy Star Rating. • Temperature compensating technology that controls batteries for the longest battery life. • Sealed maintenance free batteries. • Full light output for entire 90 minutes. • Self-diagnostics for a safe and secure lighted environment. • Pure sine wave output for all types of lamps. • ECM module is a patented technology used by DSPM. indoor and outdoor emergency lighting, exits, cash registers, computers, strategic electronics and more! • 10 Year pro-rated battery warranty. • 5 Year power train warranty. UL924, UL1778, NFPA 101, NFPA 70, NEC and OSHA. • Cities of Chicago and New York Approved. • Complies with the Buy American Act. Keep the lights “ON” when you need them the most. 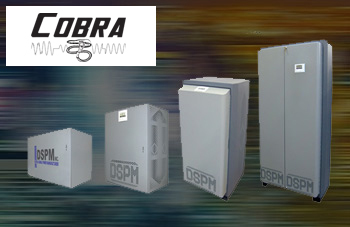 DSPM’s stand-by high efficiency emergency lighting inverters are called the Cobra. 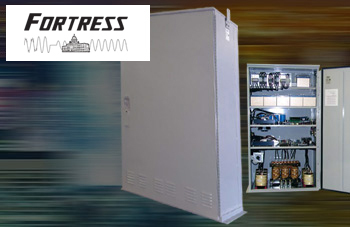 DSPM’s harsh environment emergency lighting inverter are called the Fortress Harsh. They are enclosed in a NEMA 4x or 12 cabinet which is designed to withstand rain, sleet, snow, windblown dust, splashing water and corrosion. DSPM’s outdoor emergency lighting inverters are called the Fortress. 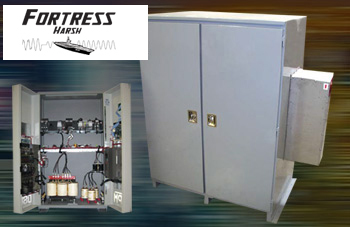 They are enclosed in a NEMA 3R cabinet which is designed to withstand rain, sleet and snow, along with windblown dust. A premium emergency Uninterruptible Power Supply System (UPS) that packs maximum battery runtime into a very small space, the EATON 9155 UPS can be equipped with an integrated, customizable power distribution module that includes a maintenance bypass switch. With premium double-conversion backup power and scalable battery runtimes, the EATON 9355 Uninterruptible Power Supply (UPS) is a complete three-phase power protection solution. The 9355 is the three-phase “big brother” to the single-phase 9155. Offering industry-leading efficiency and reliability, the EATON 93PM is an ideal three-phase solution for providing a high quality power backup system for your emergency lighting needs. As easy to deploy as it is to manage, the EATON 93PM combines vertical or horizontal scalability with handsome space-saving design and can be paired with long-lasting lithium-ion batteries.